A: Rich, hazy golden color with less than one finger of off-white foam head. Moderate lacing remains on the glass. S: Hops dominate the smell, with a surprising presence of strong grapefruit citrus, as well as melon. Light butterscotch is also detectable, adding considerable depth and complexity. No alcohol is detectable in the smell. T: Begins with off-dry piney and tropical fruit aromatic hop flavors, then sharp toasty malt emerges in the middle. Bright fruit flavors linger as the bitter, slightly mineral finish arrives. No alcohol is detectable in the flavor. M: Medium viscosity--juicy, creamy, very satisfying. Carbonation is light, staying out of the way. D: The conspicuous combination of English and West Coast qualities present in this DIPA plays wonderful tricks on the palate and the mind, conjuring appearances of the familiar and the unknown. It tastes and feels like Russian River's Pliny the Elder for the first few beats, until the diacetyl and burtonized water are detected. 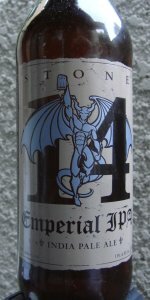 That said, Stone's celebratory brew in honor of their 14th year has its own identity, and is delicious in its own right.